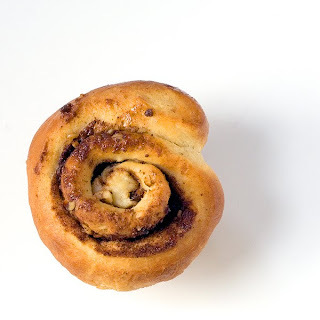 In that session, we also made Danish and puff pastry doughs to freeze and use the following week. Now, you may be thinking, "So what? She's making rolls and bread. I can do that. Who goes to school for this?" I totally understand. These are not complicated or exotic recipes to be sure, and, except for the Danish and puff pastry doughs, they require very little in the way of finesse. But I am learning that culinary school is about more than cooking and baking - at least at this early stage. For one thing, it's about learning how to really budget your time and do many tasks at once. You've got a limited amount of time to produce a large amount of food - how will you eliminate any and all unnecessary steps and movements to maximize your time and efficiency? Part of it involves set up and getting your mise en place in order. The first day, I, like everyone in class, was running around like a headless chicken trying to find rolling pins, sheet pans, flour, butter, mixing bowls, parchment paper and all the other things we'd need to bake in a then-unfamiliar kitchen. It was a bit chaotic. By now most of us are settling into the routine. Read over the recipe(s), make a mental list of everything you'll need, make a loop around the kitchen to gather it all up, set it up at your station and - voila! Order reigns supreme. And then of course you must learn to work with a partner - even if you don't get along. This is probably the hardest thing for me. I'm an only child, and if I had my druthers, I would always work alone. Aside from the fact that 9 out of 10 times I just like to do my own thing in my own way, if you work alone and something goes horribly wrong, you have only yourself to blame. I find this comforting. That said, so far I have been incredibly lucky with the partners I've been assigned to work with - they've been smart, fast, and funny. We've able to split up the work, divide and conquer, and even finish ahead of schedule. But not everyone has been so lucky ... Some people, it seems, are either unwilling or unable to follow the simplest of directions. Take Miss Always-Late-and-You-Should-Thank-Me-For-Even-Showing-Up. On dinner roll day, my partner and I finished over an hour before everyone else. Well, no one leaves until everyone is finished and the kitchen is clean, so we helped her team weigh dough and shape rolls to help speed things along. 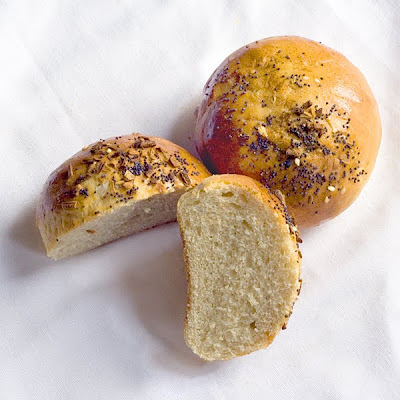 For this project, each group was assigned a different type of flour to add into the recipe so that we could compare the relative crumb and texture of the rolls after they were baked. As Miss Always Late was slooooowly weighing her dough and desultorily shaping her rolls, I asked her, based on the pale color of her team's dough, "So, I guess you guys just used all AP flour for these?" She just looked at me blankly. My partner reiterated, "So you guys used AP flour only, right?" Blinking stupidly, she answered: "These are the dinner rolls." Um, okay. "No, but what kind of flour did you use?" "These are the dinner rolls," she said again. Right. Carry on, then. My only hope is that she drops out of school before I am assigned to be her partner. Then again, I'm not looking forward to pairing up with Miss I-Am-So-Confused--Please-Someone-Tell-Me-Why-I'm-Here. One day she asked me in a quivering voice if I had known all along that we were supposed to be writing in our kitchen lab notebooks. "How did you know?" was her plaintive reply. "Did Chef tell us to write in them?" This exchange left me nearly speechless. I feel sorry for her, but I don't want to cook with her. But, as Chef pointed out, in a real kitchen in the real world you don't always get to pick who you work with. So I'll deal with it. So far, it's exhausting and fun and rewarding and the time flies. I love it - but we'll see how I feel after the midterm in a few weeks. I'm too old to take tests! As I said, these recipes (or formulas, as they're more properly called) are fairly basic so I won't bore you with all of them. I will, however, share the challah bread one because it was by far my favorite thing that we made. It was moist, and just a little sweet, and it made the most incredible French toast I have ever had. You'll need a gram scale for this one, and you'll make the preferment the night before. Just save the extra preferment to use for next time you bake this - trust me, there will be a next time! Feel free to halve this recipe, as it's going to make way more than you need. Using a dough hook attachment, mix all the ingredients until incorporated. It will be sticky. Place in a well oiled container that's twice as large as your dough amount. Let it sit, covered with plastic, for an hour or so and then refrigerate overnight. 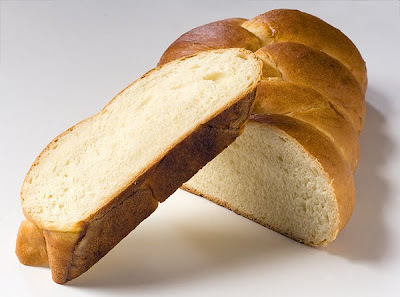 Before using it in the challah recipe, bring it out of the fridge and let it com to room temperature. Combine the water, preferment, flours, and yeast and begin to mix on low speed, using a dough hook attachment. Add the remaining ingredients and mix for 8 to 10 minutes until the dough has come together. If it's too sticky, add a bit more flour. Take it out and give it a few turns on a floured surface, by hand. Let it rest, covered with plastic, on a floured surface for 20 minutes. 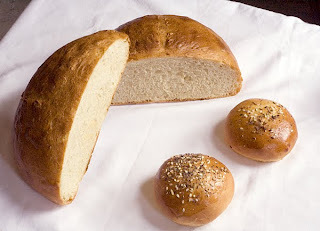 Divide the dough into 3 equal sections and form into ropes, about 1 inch in diameter. Pinch the ropes together on one end and braid the strands together, pinching and folding under when you reach the end. Allow the dough to rise, covered in plastic wrap, until it approximately doubles in size - it should just barely spring back when you press it with your finger. Brush on an egg wash and bake in a 350 degree oven until browned, about 30-40 minutes. OH how I love baking bread! These are beautiful. Your observations made me laugh! I for one like to have a "souffre-douleur" next to me, someone I can definitely blame if things don't pan out and someone with big muscles! I worked in a kitchen where challah was made weekly and thank god! there was a cute guy there, Greg, who did all the lifting we would use those gallon size cartons of egg yolks. Anyway, your breads look so nice and pro, and highly appetizing! 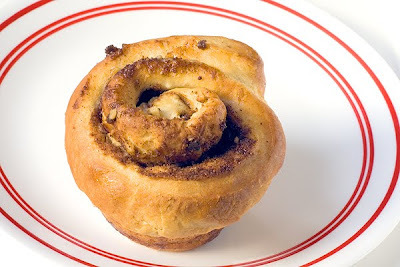 Those sticky buns look so good I feel like making some right away... Yu uH uM! Yep... And I'm gonna load them with sugar and cinnamon...! Wow, beautiful breads! 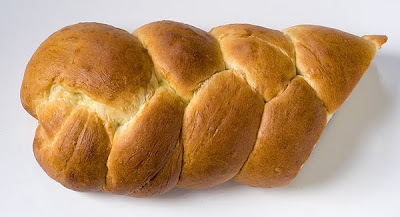 I would especially love that challah right now for Friday night, yum! Ha ha ha, love how the gossip and bitching is hidden between beautiful pictures. And I can relate..only child too and 'just let me do it so its right' attitude. I have been working on that though in the last year and playing nice. its a process. hang in there! I feel your pain - I was one of six kids and my mother always called me her only child ;-) That Patty (mom) is a funny one! What wonderful breads you're making! Yummy. Too bad about the partner-toss. But, those two young women are scary. Makes you wonder how they decided to get into the class or even what they thought the class would be like. Who doesn't take notes???!? Now, are you mailing each of us followers a loaf of bread, jug of wine, and...? Those bread look so awesome! you seem to be getting better and better. Wonderful breads! I've got to try my hand at challah some time. You have funny partners at school... to say the least. O bread, bread and more bread, I have the same "problem"! Everything looks so good, I can imagine eating those all by themselves! I think you should ditch the partner...! Wow! That is one prolific pastry class. 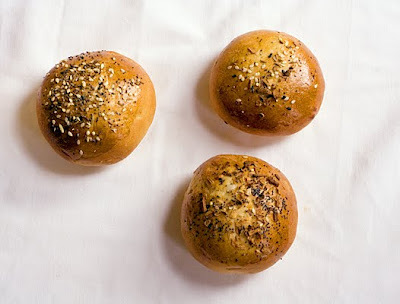 Those dinner rolls are absolutely perfect! Ahhh! Miss. Late sounds very annoying, as does the other person. The challah bread looks beautiful! I'm sure it will also make for a great French toast the following days. awesome breads and you make me smile i remember being in a kitchen in school and the chef ordering vegetarians to cook meat as it was on the menu! what gorgeous bread!love reading your adventures in school. Well at least YOU are doing an amazing job with your classes! 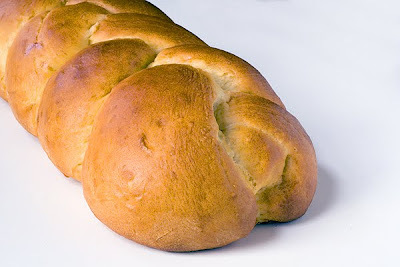 Love the challah bread! Wow! That's a lot of baking, but worth the effort. It all looks wonderful! Wow.....love all these home baked bread. I salute you for making them. Well done! I remember my days in culinary school. I know exactly what you're talking about. Working with other students in one station and there's this partner that you don't get along with and yes, they do have different personalities and character. I want to bake some bread but not in my oven. :D The challah is definitely a must try. Looks like you are paying attention in class; the breads are gorgeous! Thank god for Top Chef and the mise en place challenge...it's how I realized there was actually a better way to organize myself than constantly searching (and usually realizing I forgot to purchase an ingredient.) Not that I generally employ organization in my home kitchen but I'm starting a new venture - catering healthy, local school lunches and the idea of cooking 100 meals at a time?!?!?!?!?! SO SCARED! Any other organization tips would be much appreciated! Trix, you make me laugh. I always mean to do a mis en place... and when I do it goes so much smoother... but usually every surface is covered and I am using sticky fingers to grab something I forgot! You would hate me as a partner!